What I Love: ONE pattern piece! Added 1" seam allowances to adjust for fit... since I haven't made very many Burda patterns and I'm all over the size chart, I decided trace the middle size and add large seam allowances. I also measured the pattern piece to see if I was even close, and I was. In the end, I didn't need the 1" seam allowances. Fabric choice is important on this one... need something not too thick but not too thin with nice stretch and good recovery. There are no closures or zippers on this skirt so the waist needs to be able to go over the hips. Took in waist about 1"
Fabric is a little bit on the thin side and the waist is very flimsy... need to add something to stabilize... maybe elastic? Fabric was easy to sew, but was very "sticky". 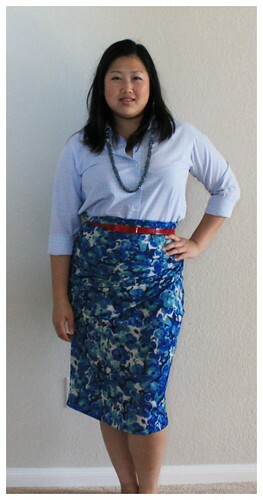 Overall: Easy, cute skirt and probably would not make again. I would recommend this to others... just beware of the bulk at the pleats.